Your account’s Trash can be a lifesaver. It has one job and one job alone: to save your recently deleted data in case you want to restore it! 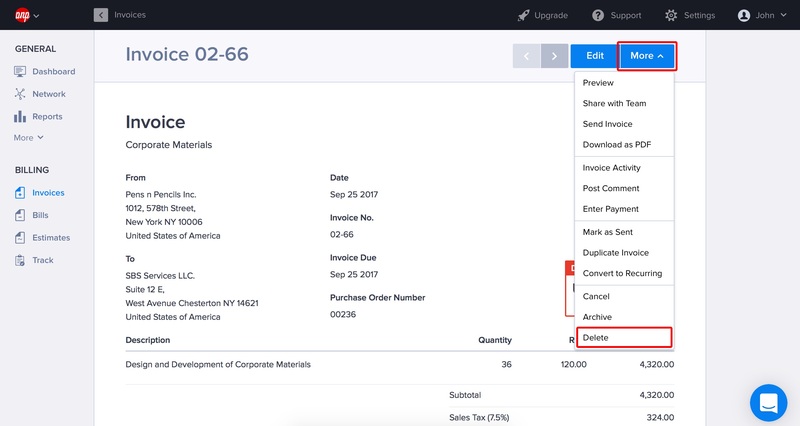 In list mode, you can delete an invoice, bill, estimate, track entry, business, file, payment receipt or saved category by clicking Settings > Delete in the dropdown box next to any item. Alternatively, if you already have an item open, you can just click More and hit Delete. To have a look at your deleted items, click the little trashcan icon on the main menu. In list mode, click the checkbox next to the item and hit Settings > Put back to send it back to where it came from. If you’d like to restore everything you have in the trash, just hit Settings > Select all before you do Settings > Put back. Clearing your trash is as easy as hitting Empty Trash. You can also delete individual items permanently from the Trash, by clicking the checkbox next to the item and selecting Settings > Delete Permanently. Warning: not all items are equal! * If the business you’re trying to delete has statements (invoices, bills, estimates) that are still in pending, you will not be allowed to delete the business. You will have to delete these pending statements before deleting the business.